I have a fear of Delaware. I really find Delaware a terrifying place, and for good reason, Delaware is crazy. You could feel fear in the air as Scott and Sharon’s Saturn sped towards the Delaware state line. 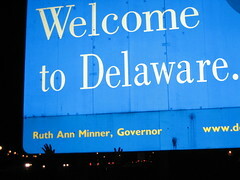 As we approached the First State I nervously began trembling, finding excuses to leave Delaware off the list of 50 states. I even proposed eliminating Delaware and adding Guam, or the Marshall Islands, but Fiddy would have none of it. 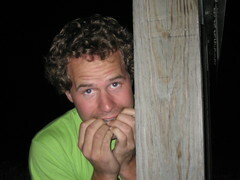 Scott and Sharon comforted me and made me confront my fears. They stopped at the state line to discuss our game plan. First on the list: welcome sign photos. This went okay, but in true Delaware fashion, it was too dark and scary for good quality photos. Next up was a stop at Wawa. Wawa is a gas station with a deli in it. That alone is terrifying. Forget the butcher, just stop by the local gas station for your meats. After quickly moving to the capitol building I was struck with the most terrifying scene imaginable. The capitol building is called the legislative hall. Risky exposure in the dark, wooded capitol area added to the tension as we frantically searched for the ‘capitol building’. Not until Sharon suggested looking at the map did we realize the name game Delaware is playing. I found much comfort in the hospitality of our new hosts. Andrew and Amanda met us at the capitol building and took us back to their house. The recently married couple is stationed here, and live in off-base military housing. I’m relieved to know I have professionally trained combat personnel in every direction to protect me. Maybe now, I’ll be ready to confront my fears. WaWa is an awesome place though, not only do they usually have the cheapest gas, you can buy a whole lunch inside in the marketplace! And the food is really good...my co-workers and I go at least twice a week! If I'm not at work when you all drive through Maryland, I'll be on the lookout for ya! Matt do the same to what they did to Mr. T (A-Team) and give Scott sleeping pills in a steak before going into Delaware. Well I guess you are in Delaware already but maybe save it for another state like Kentucky. Kentucky scares me. Maybe it was was a bad experience with Kentucky Fried Chicken but Kentucky freaks me out. Probabilmente nssuno comprenderà ciò che scriverò,però mi piace la vostra idea. Un "cazzo figata" da Valdobbiadene,Treviso,Italia. and see where you might go next ! It was a blast driving you to NJ and DE yesterday! Thanks for sharing a piece of your adventure with us! Godspeed on your journey! I was just thinking about how the two things you guys needed on this site were a list of the capitals you've been to, and a path marking your actual progress. So glad that you added both. Without me even having to say anything. I love your blog! Too bad you came through Boston already!